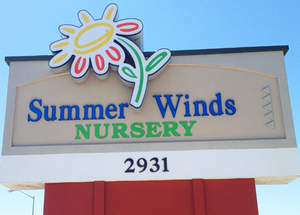 SummerWinds will continue to operate six nurseries in the Peninsula and South Bay, including the garden center in Santa Clara (2931 El Camino Real, near Bowers). SUNNYVALE, CA--(Marketwired - Jul 18, 2014) - SummerWinds Nursery will be closing its Sunnyvale, California, nursery (861 E. El Camino Real) in mid-September. The lease term was due to expire soon and the owner sold the property to a hotel developer. 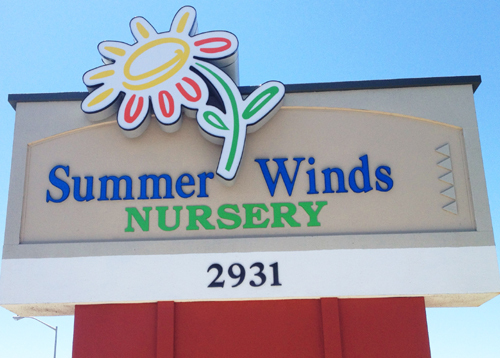 SummerWinds Nursery has six other full service locations in the Peninsula and South Bay. The closest are in Santa Clara (which is less than two miles away at 2931 El Camino Real), Mountain View and Cupertino. "We regret having to close our Sunnyvale store," said Frank Benzing, President and CEO of SummerWinds. "We appreciate the tremendous support from the community over the years, and the wonderful service our associates have provided. We look forward to serving our Sunnyvale customers at our other locations, and many of our valued associates will transfer to other SummerWinds stores." The Sunnyvale store intends to operate its regular hours (8:30 a.m. until 6:00 p.m.) until it closes mid-September. There will be an ongoing store-wide clearance sale on all in-stock items. SummerWinds Nursery offers an assortment of edibles, perennials, bedding plants, pottery, houseplants, trees, shrubs, organic fertilizers and more. The company supports local growers and partners, several of whom sell exclusively to independent garden centers like SummerWinds. SummerWinds will continue to serve the Peninsula and South Bay Area--as it has done for decades--with six remaining full-scale nurseries. The Santa Clara nursery is at 2931 El Camino Real (408-423-8445), less than two miles southeast of the Sunnyvale location. The other local SummerWinds nurseries are in Mountain View (805 Yuba Drive, 650-967-3154), Cupertino (1491 S. De Anza Boulevard, 408-996-8355), Palo Alto (725 San Antonio Road, 650-493-5136), Campbell (2460 S. Winchester Boulevard, 408-866-0171), and San Jose (4606 Almaden Expressway, 408-266-4440). The company also owns Green Thumb Nursery in Los Gatos (15796 Winchester Boulevard, 408-395-6050) and has two small-scale boutique nurseries-located adjacent to Target: one in Albany (1057-A Eastshore Highway, 510-558-3146) and one in Fremont (39201 Fremont Boulevard, 510-818-0713). SummerWinds Nursery is a leading high-end retailer of garden and nursery products. With headquarters in Boise, Idaho, SummerWinds operates retail nurseries in the Silicon Valley of California, Phoenix, Arizona, and St. Louis, Missouri, ranking as one of the largest independent retail nursery companies in the nation. SummerWinds appeals to both the serious and casual gardener with a broad selection of premium gardening products and friendly and knowledgeable staff. For more information, go to http://www.summerwindsnursery.com.